Florence's Most Famous Family: Who were the Medicis? 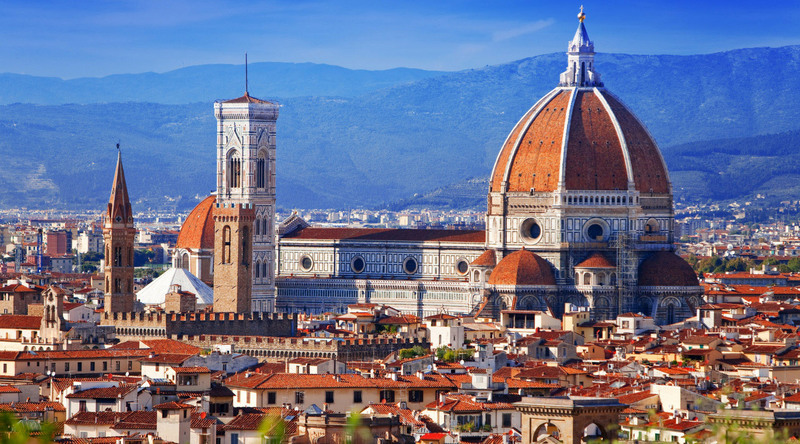 Home/Destination Immersion® Experiences Blog/Florence's Most Famous Family: Who were the Medicis? Have you been to Florence? If so, you’ve likely heard of the Medici family. Their legacy has left a lasting impression upon the city. But who were they? A common misconception is that the Medicis were a royal family. In fact, they were not royalty. But they were rich and politically powerful. During the 12th century, members of the Medici family relocated from the Tuscan village of Cafaggiolo to the city of Florence. There, the House of Medici gained wealth through banking and commerce. The Medicis used their riches to influence politics, religion, and culture. What makes the Medicis unique is that they acquired the hereditary title of dukes of Florence (and later, grand dukes of Tuscany) not through the typical channels of birthright or marriage, but through commercial success. Their dynasty ruled Florence for nearly 300 years. Interested in traveling to Florence and Tuscany? Browse upcoming voyages now. According to legend, the Medici dynasty descended from a giant-slaying knight in Charlemagne’s army. The House of Medici coat of arms, which depicts five red circles on a gold shield, is said to be inspired by the knight’s own shield. Of course, this is all the stuff of legend and entirely unproven. Another theory suggests the red circles represent the exchange of money, a fitting depiction for a family of bankers. When you visit Florence, you’ll see the coat of arms on many buildings that were connected with the family. Born in 1360, Giovanni di Bicci de’Medici can in some ways be considered the original Medici. Although earlier family members are known to history, it was Giovanni who founded the Medici Bank that catalyzed the family’s rise to power. Giovanni was not born into wealth. In fact, he inherited very little upon his father’s death. So how did this man amass the familial wealth that launched the Renaissance? Giovanni spent his early years working for a chain of Italian banks, before founding his own in 1397. Five years later Giovanni’s bank had three branches and he’d purchased a wool factory. After a few more years he expanded again and began trading silk, jewelry, spices, olive oil, and other goods. An empire was born. Though he occasionally served in government, Giovanni generally avoided politics and preferred to focus on business. At the time of his death, he was one of the richest men in Florence and passed his business on to his two sons, Cosimo and Lorenzo. Giovanni’s son Cosimo de’Medici, known as Cosimo the Elder, was one of the wealthiest men in Europe during his lifetime. Building on the legacy of his father, he was the first Medici to simultaneously run the Medici Bank and serve as a de facto ruler of Florence. Cosimo rose to political power in 1434 but rarely held public office. Instead, he used his wealth to influence votes. He ruled Florence until his death in 1464. His support of arts and humanities in Florence turned the city into the cradle of the Renaissance. Everything you know and love about Florence today – the amazing museums, the gorgeous architecture, the al fresco art galleries – began thanks to Cosimo the Elder. Cosimo supported many artists, including famous names like Brunelleschi, Donatello, and Fra Angelico. He established a small museum at the Uffizi building, which is now the famous Uffizi Gallery. Today, it’s home to many of the Renaissance-era treasures owned by the Medicis and is the most visited art gallery in all of Italy. Cosimo’s heirs continued his legacy of supporting the arts. His grandson, known as Lorenzo the Magnificent, was a poet and the most influential patron of Renaissance culture in Italy. Lorenzo had been groomed for power from a young age, and took over leadership of Florence in1469 at the age of 20, following his father’s death. Like his father and grandfather, Lorenzo ruled Florence without holding public office. He sponsored some of the most famous Renaissance artists, including Botticelli, da Vinci, and Michelangelo. Lorenzo personally commissioned only a few works but helped artists secure commissions from other patrons. Lorenzo even shared his family home with a teenaged Michelangelo for several years. It wasn’t until 1512 that, thanks to efforts from Piero’s younger brother, a Catholic church Cardinal named Giovanni, the Medicis were able to return to Florence and regain their status there. Giovanni was elected Pope just one year later. As Pope Leo X, Giovanni de’Medici continued his family’s legacy of supporting the arts. The years following his return to Florence can be seen as a peak in the Medici family’s influence. Following Leo X, the Medici family went on to produce three more popes: Clement VII, Pius IV, and Leon XI. Several family members married into royal families across Europe. Two Medici women, Catherine and Marie, became queens of France. The Medici Lions, a pair of marble lion sculptures, can be seen at the Loggia dei Lanzi outdoor museum in Florence. By the 1520s, few descendants of Cosimo the Elder remained. Instead, the branch of the family descending from Giovanni di Bicci de’Medici’s other son, Lorenzo the Elder, continued the dynasty. These descendants included Cosimo I, who became Duke of Florence in 1537 and grand duke of Tuscany in 1569. He re-established power in the region, and both his sons served as dukes. While the elder son Francis was not a very successful ruler, the younger son Ferdinand oversaw a period of fortune and solidity in Tuscany. He continued the family’s patronage of the arts, bringing many valuable works of art to Florence. A statue of Cosimo I in Piazza della Signoria in Florence. In the early 1600s, a young up and coming scientist (you may have heard of him), Galileo Galilei, took a job tutoring Ferdinand’s teenage son. Galileo dedicated a book, “The Starry Messenger”, to his student. The Medici son, yet again named Cosimo, later succeeded his father and rewarded his tutor Galileo with the profitable position of mathematician and philosopher to the grand duke. In 1737 Gian Gastone de’Medici died, leaving no heirs. He’d been the seventh Medici family member to serve as grand duke of Tuscany. After nearly 300 years the Medici dynasty came to an end. The leading European powers at the time came to an agreement to pass control of the Tuscan state on to Francis, Duke of Lorraine. Six years later, sister Anna Maria Luisa de’Medici died, leaving no children. She willed the Medici family’s massive collection of Renaissance art and treasures to the state, upon the condition that they always remain in Florence. When visiting Florence today, one doesn’t have to search hard to see vestiges of the Medici’s influence scattered across the city. They left their mark in churches, palaces, museums, and gardens. Anna Maria Luisa de’Medici’s decision to bestow her family’s art collection to the state upon the condition that it remains there further solidified the Medici legacy. It helped establish Florence as a mecca for art lovers. Today, Florence is one of the most beloved travel destinations in the world. The aforementioned Uffizi Gallery is, of course, thanks to the Medici family. In 2016, the museum received more than two million visitors—it’s a good idea to book ahead of time if you’d like to go. The Galleria dell’Accademia di Firenze is also renowned for its art collection, which includes Michelangelo’s masterpiece David. A wing of the museum devoted to musical instruments includes works commissioned by the Medicis and illustrates the family’s devotion to music, theater, and ballet. Often called Pitti Palace, this grand estate was constructed for Florentine banker Luca Pitti in 1458 and purchased by the Medici family in 1549. It served as the main residence of the grand duchy of Tuscany. Today, Palazzo Pitti houses several museums, including the Palatine Gallery, the Royal Apartments, and the Museum of Costume and Fashion. The Boboli Gardens sit behind Palazzo Pitti but require a separate entrance ticket from the museum complex. The development of the lush, lavish gardens spans 400 years, as both the Medici and Lorraine families enlarged and enhanced the gardens during their reigns. Today, Boboli Gardens is an 11-acre open-air museum and park. The gardens are home to sculptures from the 16th, 17th, and 18th centuries, including the famous Fountain of Neptune. An exploration of the House of Medici legacy in Florence wouldn’t be complete without visiting the family’s final resting place at the San Lorenzo Church complex. The Basilica di San Lorenzo claims to be the oldest church in Florence—though several churches in Florence make this claim. Records show that a church on this site was consecrated in 393, proving at the very least that Basilica di San Lorenzo is among the city’s oldest churches. The basilica was the parish church of the Medici family. In the 1400s, Giovanni di Bicci de’Medici financed the rebuilding of the church itself. Later, other family members commissioned additional buildings. Today, visiting complex is like stepping into a who’s who of Renaissance and Baroque architecture. Buildings and sculptures were designed by the likes of Filippo Brunelleschi, Michelangelo, Donatello, and Matteo Nigretti. The Medici Chapels are comprised of two buildings within the complex: Michelangelo’s New Sacristy, and Nigetti’s Chapel of the Princes. The Medici Chapels are lauded as being San Lorenzo’s grandest displays of architecture. Several Medici family tombs are housed at the Old Sacristy, which was designed by Brunelleschi. The New Sacristy was meant to contain four tombs but only two were finished. The result of this incomplete work is that two relatively unimportant Medici family members have the most ornate tombs, while more prominent Medicis—Lorenzo the Magnificent and his brother—are modestly buried beneath the altar. Steps away from the Basilica di San Lorenzo is the Palazzo Medici Riccardi. Don’t let the palace’s plain exterior fool you—the simple façade was intentional. The Medici family used this palace in the early 15th century, while they kept a low profile following a brief exile from Florence. Later, the palace was occupied by less prominent Medicis. Inside Palazzo Medici Riccardi, the family’s great wealth is on display. The palace is most famous for the Chapel of the Magi, thanks to the stunning 15th-century frescoes by Benozzo Gozzoli that adorn the walls. Visiting museums and art galleries is a popular activity when exploring a new city. As travelers, we’re curious about the world around us. We want to dig beneath the surface of a city to explore its history and immerse ourselves in its culture. It’s why we offer hundreds of unique onshore experiences dedicated to art and culture—you can browse them here. The idea that art has importance and value beyond mere decoration was born out of the Italian Renaissance. And the Italian Renaissance was born out of the Medici family’s passion for and patronage of art, music, science, and philosophy. They used their immense wealth to sponsor some of the greatest and most influential artists and thinkers of the era. The revival of an appreciation for art, learning, philosophy, and science that is synonymous with the Renaissance period spread across Europe, forever shaping the course of history.